I’ve got a crush, and it just so happens to be on velvet. Get it? Crushed velvet? I tried, you guys. If you follow me on SnapChat (username: merrittbeck), you may have seen these sneakers yesterday. I’m obsessed! They’re definitely the next purchase I’m going to make. I have a feeling I’ll get my money’s worth, especially when I’m walking all over Japan and Hong Kong in November! The rich blue color and unique gold hardware on this Stella McCartney bag make it a fabulous statement style for the season! Love this look! This simple long-sleeved black dress is the perfect blank slate for holiday parties. Just add a fun pair of earrings, a red lip and your favorite fancy heels! I’m not usually a fan of wide leg pants, but this velvet Vince pair looks SO comfortable! An elegant and modern look for cocktail parties. Add some fall color to your wardrobe with these ruby-hued ankle-strap pumps! Darling. If you like to be hands-free at events, parties and weddings, you need to pick up this Saint Laurent shoulder bag. Featuring black velvet and adorable matching tassels, it’s subtle while also making a statement. I just purchased my first velvet piece and I looove it. I’m in love with velvet too! This is so well done, Merritt. Obsessed with that velvet cami! love those block heel shoes! 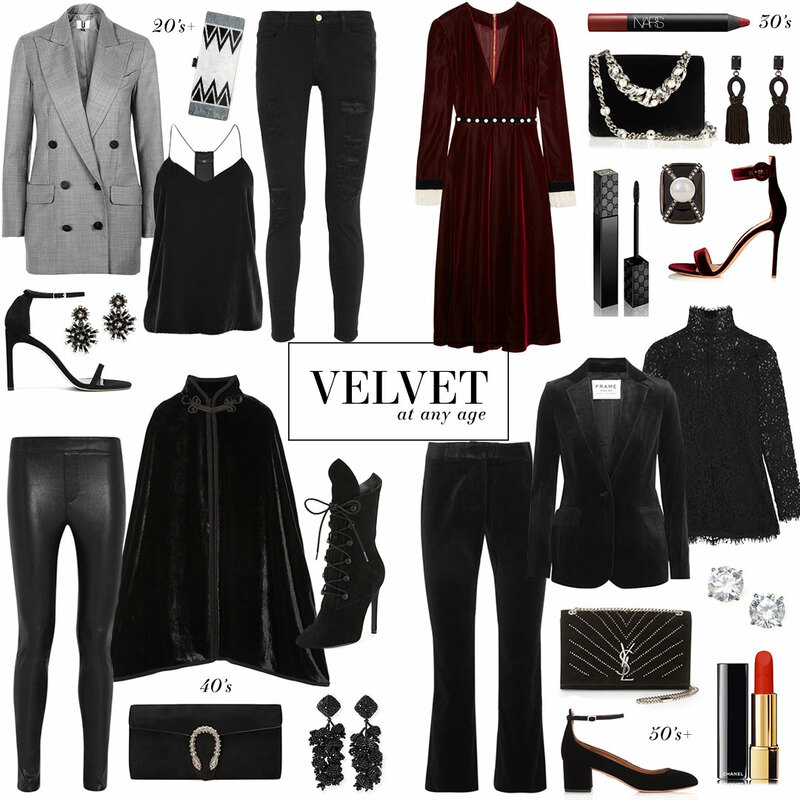 I’ve been obsessed with velvet since I was a freshman in HS, but it was never in style. As such, I am THRILLED that it’s in style and there’s a ton of brands with velvet styles.